No matter the place, a computer table 47 1/2"W x 29 3/4"D x 28 3/4"H to fit almost any available space. Durable 3/4" melamine laminate top worksurface. This smart computer table folds down to just 5 1/4" for easy mobility and compact storage. Uniquely designed with an attached keyboard shelf that has six different adjustable positions for height and tilt. The table holds CPU's up to 19"D or up to 100 lbs. evenly distributed. Steel tubular legs with black end caps to protect floor surface. Folds down to just 5-1/4" for easy transport between rooms and convenient storage. 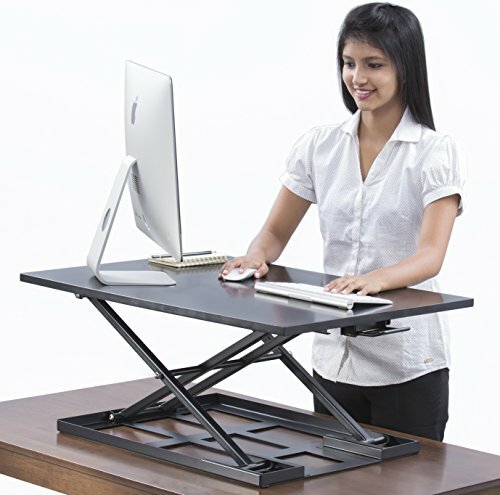 SAFCO Folding Computer Table includes a keyboard shelf that adjusts to six different height and tilt positions for optimum comfort and ergonomics. Accommodates CPUs up to 19" deep. Durable laminate surface is supported by strong steel legs. 100-lb. capacity. Folds to 5-1/4" deep for storage and mobility. Drop keyboard shelf with six height and tilt positions. Holds CPU up to 19" deep. Folds to 5-1/4" deep for storage and mobility. Drop keyboard shelf with six height and tilt positions. Light gray 3/4" laminate top on medium gray steel legs with black end caps. Holds CPU up to 19" deep. 47-1/2w x 29-3/4d x 28-3/4h. Global Product Type: Tables; Diameter: N/A; Width: 47 1/2 in; Depth: 29 3/4 in. 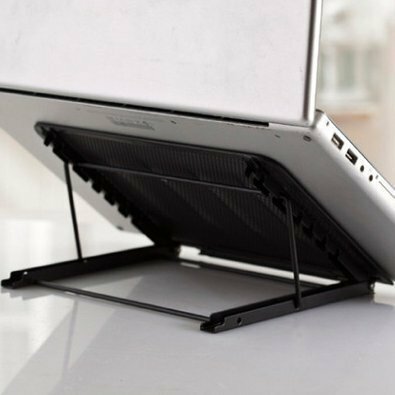 Adjustable stand positions laptop at personal viewing levels, reducing glare and eye fatigue. Unique design allows unit to fold flat for portability. Durable steel mesh construction provides strength and stability and is stylish enough for any work station. 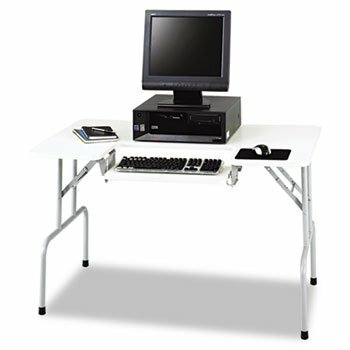 strongSAF1935GR/strongBR/Safco Folding Computer TableBR/Folds to 5-1/4quot; deep for storage and mobility. Drop keyboard shelf with six height and tilt positions. Light gray 3/4quot; laminate top on medium gray steel legs with black end caps. Holds CPU up to 19quot; deep. 47-1/2w x 29-3/4d x 28-3/4h. 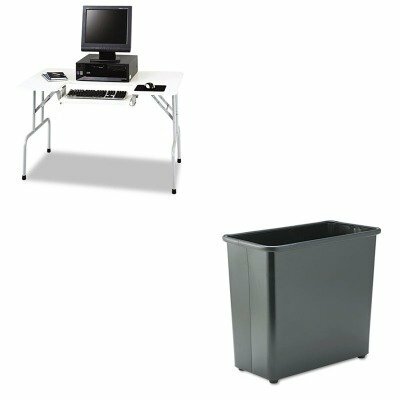 Top Color: Light Gray/Medium Gray Top Shape: Rectangular.BR/BR/strongSAF9616BL/strongBR/Safco Fire-Safe WastebasketBR/Just the thing for an active office. Fire-safe steel with powder coated finish, will not burn, melt or emit toxic fumes. Color-coordinated vinyl bumper tops no-mar polyethylene feet. Raised bottom prevents heat transfer to floor. Waste Receptacle Type: Wastebaskets Materials: Steel Application: Office Waste. lt;stronggt;SAF1935GRlt;/stronggt;lt;BR/gt;Safco Folding Computer Tablelt;BR/gt;Folds to 5-1/4amp;quot; deep for storage and mobility. Drop keyboard shelf with six height and tilt positions. Light gray 3/4amp;quot; laminate top on medium gray steel legs with black end caps. Holds CPU up to 19amp;quot; deep. 47-1/2w x 29-3/4d x 28-3/4h. 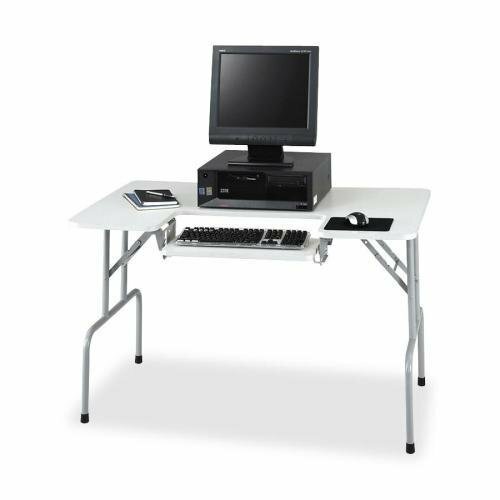 Top Color: Light Gray/Medium Gray Top Shape: Rectangular.lt;BR/gt;lt;BR/gt;lt;stronggt;SAF9445CYlt;/stronggt;lt;BR/gt;Safco Folding Computer Tablelt;BR/gt;5/8amp;quot; thick compressed wood cabinetry with a durable laminated finish. Full-extension drawer holds letter size files. Contemporary black elliptical drawer pulls. Fully finished back. Can only be used on the bottom. Color: Cherry Overall Width: 29 3/4amp;quot; Overall Depth: 11 3/4amp;quot; Overall Height: 29 3/4amp;quot;. lt;stronggt;SAF1935GRlt;/stronggt;lt;BR/gt;Safco Folding Computer Tablelt;BR/gt;Folds to 5-1/4amp;quot; deep for storage and mobility. Drop keyboard shelf with six height and tilt positions. Light gray 3/4amp;quot; laminate top on medium gray steel legs with black end caps. Holds CPU up to 19amp;quot; deep. 47-1/2w x 29-3/4d x 28-3/4h. 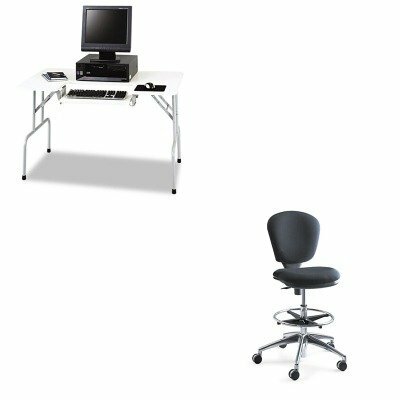 Top Color: Light Gray/Medium Gray Top Shape: Rectangular.lt;BR/gt;lt;BR/gt;lt;stronggt;SAF3442BLlt;/stronggt;lt;BR/gt;Safco Folding Computer Tablelt;BR/gt;Contoured back and thickly cushioned seat for superb comfort. Chrome-plated footring adjusts for individual preference. Large base for added stability. Recommended Applications: Drafting, Warehouse amp;amp; IndustrialStools Seat/Back Color: Black Arms Included: No. lt;stronggt;SAF1935GRlt;/stronggt;lt;BR/gt;Safco Folding Computer Tablelt;BR/gt;Folds to 5-1/4amp;quot; deep for storage and mobility. Drop keyboard shelf with six height and tilt positions. Light gray 3/4amp;quot; laminate top on medium gray steel legs with black end caps. Holds CPU up to 19amp;quot; deep. 47-1/2w x 29-3/4d x 28-3/4h. Top Color: Light Gray/Medium Gray Top Shape: Rectangular.lt;BR/gt;lt;BR/gt;lt;stronggt;SAF3265BLlt;/stronggt;lt;BR/gt;Safco Folding Computer Tablelt;BR/gt;Attractive organizer helps you stay on top of desktop clutter. One vertical section holds file folders and binders. Three horizontal sliding trays accommodate any letter size documents. Bottom tray may be removed and replaced with the mesh drawer organizer, sold separately. Durable steel mesh construction. Desktop Supplies Organizer Type: Desktop Sorter Number of Compartments: 4. No matter the place, a computer table to fit any space. This computer table folds down to just 5-1/4" for easy mobility and storage. 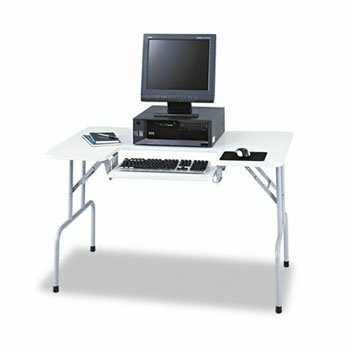 Good price at B001MS6VRK/?tag=hopeteamv-20 Safco Products 1935GR Folding Computer Table with Adjustable Keyboard Shelf, Gray pre-owned. 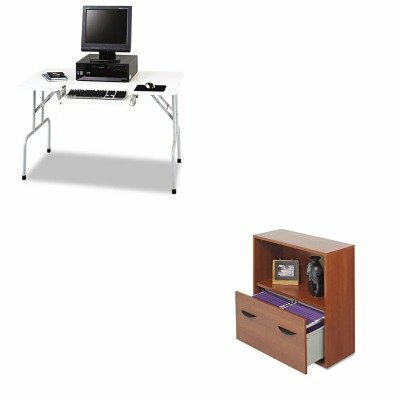 Get the gifts ideal for Safco Products 1935GR Folding Computer Table with Adjustable Keyboard Shelf, Gray. 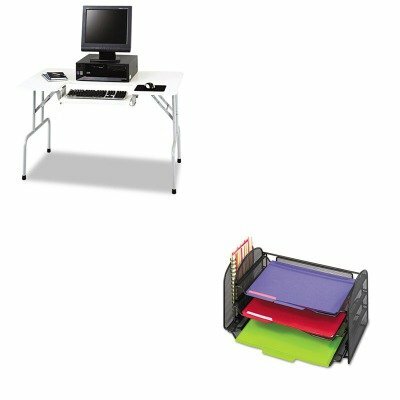 Compare prices on Safco Folding Computer Table at ShoppinGent.com – use promo codes and coupons for best offers and deals. Start smart buying with ShoppinGent.com right now and choose your golden price on every purchase.